Cementite (Fe3C) is the most common carbide compound in steels and has also been proposed as a host for the light element in Earth’s core. Because the material is metastable at ambient pressure and temperature, its synthesis is challenging, and high pressure techniques are required. As a result, key thermodynamic properties, particularly the temperature-dependent heat capacity, are poorly constrained despite their importance in several different disciplines. In principle, it is possible to calculate the properties using computational techniques, but thus far, such methods have not been sufficient to reproduce anomalies in the thermal expansion of the material. This information in turn is necessary to accurately determine the heat capacity. 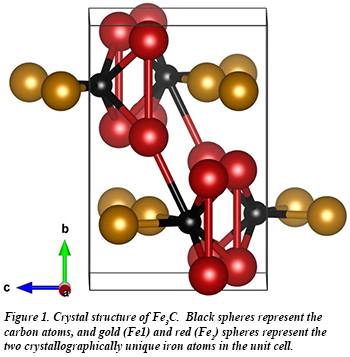 Fe3C has an unusual orthorhombic crystal structure, with two crystallographically unique Fe atoms in the unit cell (Fig. 1). 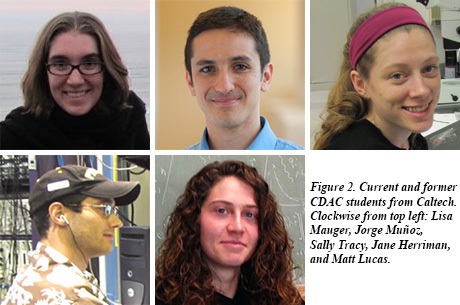 A recent publication by former CDAC students Lisa Mauger, Jorge Muñoz, Sally Tracy, and Matt Lucas, along with current CDAC student Jane Herriman and Yuming Xiao of HPCAT reports on experimental work designed to uncover the cause of the anomalous thermal expansion behavior in Fe3C. Nuclear resonant inelastic scattering measurements carried out at Beamline 16-ID-D at HPCAT have provided data on the phonon densities of states (pDOS) from 14 to 600 K. Analysis of the pDOS data supported by first principles calculations yields the vibrational entropy, which in turn allows calculation of the thermodynamic properties of interest. The results show a shift of the low-energy phonons to higher frequencies with increasing temperature, approaching the ferromagnetic - paramagnetic transition at 460 K. Effects on the pDOS resulting from increasing temperature have been ascribed to thermal expansion and anharmonic phonon-phonon interactions. This interpretation is supported by results from simulations showing that temperature effects on the pDOS spectra are localized to the collection of Fe2 atoms in the structure, both in Fe2-Fe2 and Fe2-C interactions [L. Mauger, et al., Phys. Rev. B 95, 024308 (2017)].